Hot and cold milk froth for cappuccinos,hot milk for lattes. Maximum capacity: 125 ml (for milk froth preparation), 250 ml (for hot milk preparation). 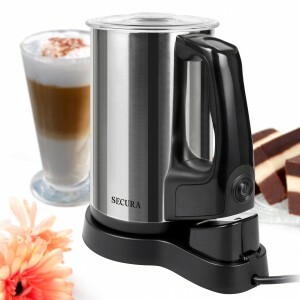 Maximum and minimum level indicators, Stainless-steel exterior with vacuum insulation; Detachable base with extra whisk storage. Product Built to North American Electrical Standards, 120V. ETL. 2-YEAR Warranty.